Content: Carlton Drake's life foundation is a firm which committed itself to science and advancement of humanity. Therefore the firm boss doesn't back off from experiments with humans. When his own space shuttle takes extraterrestrial parasites to earth, he tests them with animals and persons. Most die immediately at contact. As journalist Eddie Brock enters into the laboratory with the help of doctor Dorah Skirth to get some pictures, he becomes infected with a parasite. Unlike the other test subjects his body does not reject it but enters a symbiosis with it. Together they become "Venom" and manage to flee from the lab. Opinion: Venom is a weaker superhero movie of this year, but it provides some working elements. Biggest plus being actor Tom Hardy with a portray of an understandable character, his fear, agitation and anarchical behaviour. Also snub nose Michelle Williams is a win for the film. Scenes in San Francisco are beautiful. Another time jumping with bikes and cars over hilly streets. Conclusion: There is nothing new, moreover outside of the Avengers storyline. 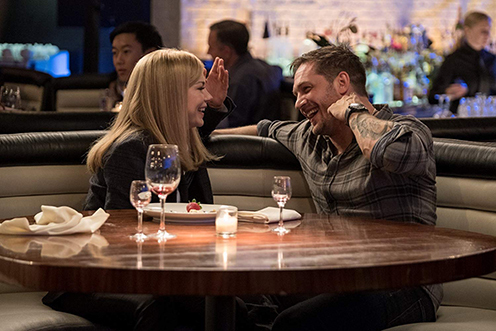 So it seems abdicable, but Venom is enjoyable and manned with a superb main actor. 3 of 6 possible "Gomtuus"